What if our world were a kinder, wiser, more compassionate place? A place where we exercise our minds just like we exercise our bodies? A place where transforming your mind not only improves your own well-being, but cascades to the well-being of others in your community and around the globe? 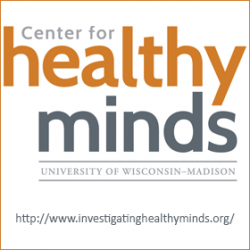 We’re making this vision a reality at the Center for Healthy Minds at the University of Wisconsin–Madison. Faced with mental and physical health challenges at a global scale, we conduct rigorous scientific research to bring new insights and tools aimed at improving the well-being of people of all backgrounds and ages. Our research, rooted in neuroscience, comes down to one basic question: What constitutes a healthy mind? To begin to answer this, we’ve investigated the science of emotions, contemplative practices and qualities of mind we suspect affect well-being, including attention, resilience, equanimity, savoring positive emotions, kindness, compassion, gratitude and empathy. The Center, part of one of the world’s top research institutions, benefits from cross-disciplinary collaborations in the arts and humanities, the physical and natural sciences, and the social sciences. We take pride in being a global hub for innovations in affective and contemplative neuroscience in addition to well-being across the lifespan.